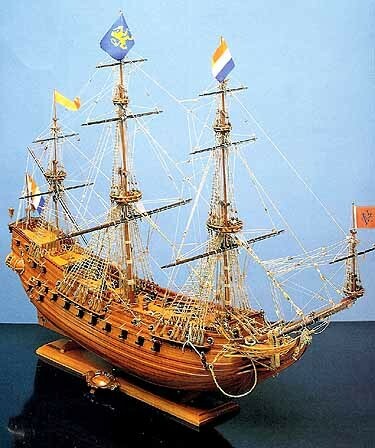 The Prins Willem was probably the largest square stern ship of the fleet of the Dutch East India Company. 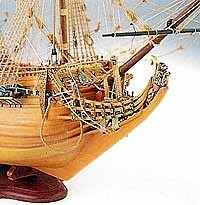 Fitted out at Middleburg in 1649-1650, she sailed with a crew of 254 plus 22 wives and children. After one commercial voyage, she was modified for use as a warship and taken into the Dutch Navy. 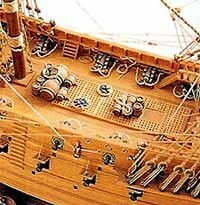 In addition to demolishing the forecastle and the stern bulkhead, 6 firing ports were added, three on each side. For a brief period, the Prins Willem was the flagship of the famous Admiral Witte de Witt fighting in the battle of Duins in 1652. Returned later to the company, it once again traded with the Indies between 1653 and 1660. Corel’s model is double plank-on-bulkhead with pre-cut parts. Ready-to-use fittings of fine hardwoods, gilded cast metal and photo-etched brass are typical of Corel’s attention to quality. Length 29 1.2″ / Height 23″ / Scale 1:100.